The primacy of the social objectivations of everyday life can retain its subjective plausibility only if it is constantly protected against terror. On the level of meaning, the institutional order represents a shield against terror. To be anomic, therefore, means to be deprived of this shield and to be exposed, alone, to the onslaught of nightmare. While the horror of aloneness is probably already given in the constitutional sociality of man, it manifests itself on the level of meaning in man’s incapacity to sustain a meaningful existence in isolation from the nomic constructions of society. The symbolic universe shelters the individual from ultimate terror by bestowing ultimate legitimation upon the protective structures of the institutional order. Peter L. Berger and Thomas Luckmann, The Social Construction of Reality, Allen Lane, The Penguin Press, London 1967, p. 119f. In this deeply disturbing painting the massive reality of the everyday is represented by the routine of prayer and the everyday objects of the mundane world – Berger's 'symbolic universe': the loggia and the garden beyond, the four-poster bed, the leaded window, a shelf with a small still-life painting, books, an inkwell and a candlestick, a coat hanger, a stool with an hourglass, a prayer-desk and the cat. Can there be any doubt that these objects of the quotidian are not there just by accident? This comforting reality is ruptured by the arrival of the staring angel, just landed, and the appearance of the figure of God in the background. The everyday routine of prayer is shattered as another reality breaks through. Mary, in shock, has turned her back on the angel, the hands that had been clasped in prayer have opened in surprise. She looks straight into our eyes. In an outstanding break with tradition Lotto moved from the depiction of a demure woman calmly receiving the message that she has been chosen to be the mother of the Son of God to an image of a shocked girl in a moment of 'anomic terror'. 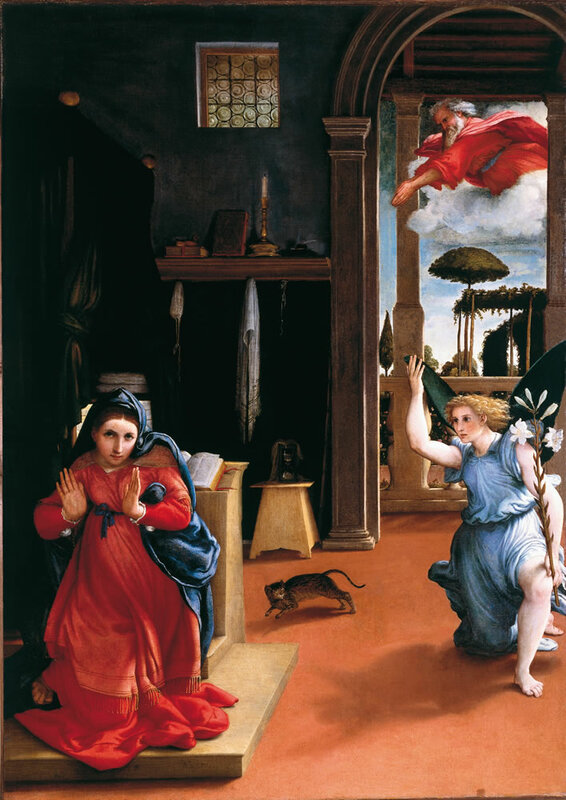 The terror of the fleeing cat, its back arched, shows us that this manifestation is not simply a figment of Mary's imagination but a shared objective reality.